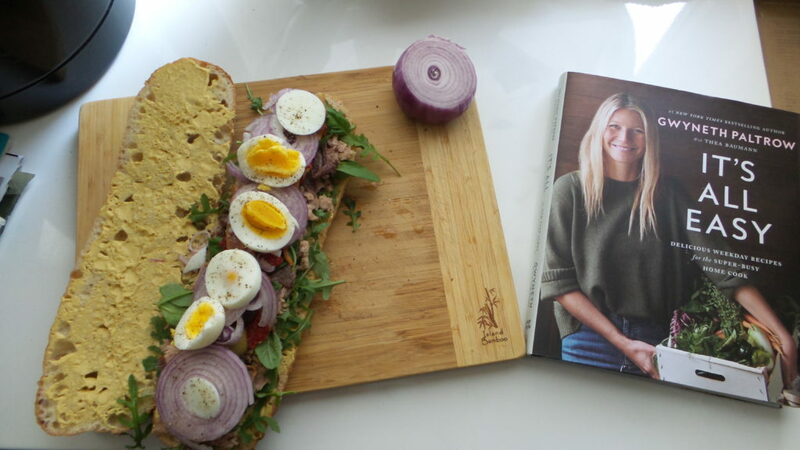 The cookbook is a beautiful display of food with pictures from Paltrow’s private life at home with her kids. The recipes were designed to use items that should already be in your pantry. 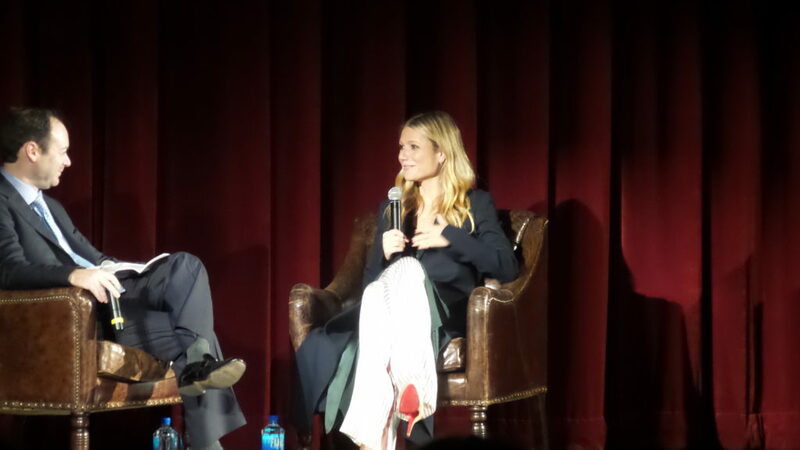 I will admit that I loved hearing her talk about life. She seems so down to earth. She dispelled a lot of myths out there about her and how she’s raising her kids. People think she’s some whack job raising her kids to be vegan with no sugar, etc. Ends up, she lets her kids choose how they want to eat. She’s a meat eater, but her daughter has always refused to eat meat. Her daughter was born a vegetarian. There was nothing she could do about that. Her son is gluten intolerant and is very cautious with what he eats. Would she forbid her kids from eating cake, Doritos or Oreos? No. She’s not cruel. She’ll have her Oreos and eat them, too. This cookbook is beautifully done. The recipes all look so mouthwatering. I couldn’t wait to make her Pan Bagnat. I hate to say this, but in a way, after I got my receipt, I thought that this is a great example of how Paltrow can have a bit of a disconnect with the middle class. People have complained that her line of products caters to the wealthy. This is a prime example of catering to them. These items she suggests to make this sandwich are not commonly found in most homes. Tuna? Yes, that is something you’ll find in your pantry. Tuna in olive oil? That exists? I actually stood in front of the tuna shelves at the grocery store for 5 minutes just trying to locate the ONE BRAND they have of tuna in olive oil. She notes that it is important to have qualitative ingredients. The tuna and baguette really make or break this sandwich. I will agree with the baguette part, not so much with the tuna statement. At $6 for a can of tuna in olive oil, after tasting this sandwich, it would have been better with the 59 cent can of tuna in water from Aldi’s. It would have also tasted better with less anchovies. Two anchovies would have done the job. Eight anchovies and this becomes the saltiest sandwich you’ve ever eaten. Don’t forget you are also supposed to add more salt onto the eggs in this recipe. Going based on the recipe from the cookbook, I gave this recipe 3 stars. The concept is awesome, but it could have been better. It was too salty and oily for my taste. The next time I make this, it will be modified to have the cheaper tuna in water, 2 anchovies, no salt, and less oily substances. It can be healthier with less salt and oil. Another variation I made of this recipe that I enjoyed immensely was the salad version. Throw all of the ingredients into a bowl, tear up a few pieces of the bread, and add a honey dijon dressing (easiest way to do this: take some dijon mustard, add some honey and top it off with Caesar dressing, stir, and add to the salad. Taste the dressing before putting it on to make sure it’s to your liking. I like it a little on the sweeter side, so I’ll add more honey so it’s not too spicy.) The salad version of the pan bagnat is so much tastier. I became so obsessed with it, it was the only thing I ate for a week. It was so good. The basil and sun dried tomatoes were what made it so tasty. Try the sandwich/salad out with the modifications I list above, and this may end up being your new GO TO sandwich. I’m looking forward to trying out many of the other recipes in her cookbook. They all look so good. I’m looking forward to making the Zuni Sheet Pan Chicken, the Thai Curry Noodle Pot, and her Thai-style crab cakes. I love her ideas for soups in a jar. It’s a great take on the popular jar salads. The best way to utilize Paltrow’s cookbook (for those on a budget) is to use the ingredients you already have at home. She may list something like ‘tuna in olive oil,’ just use what you have in your pantry (regular tuna). That was the whole purpose of her book. The majority of these ingredients should already be in your pantry. Not everyone it going to have the expensive stuff, but you probably have something similar to it. Use that. Luckily, most of her cookbook repeats a lot of the same ingredients. She uses arugula, eggs, baguette bread, lemons and anchovies a lot. So that $60 I spent to make this sandwich, the leftover ingredients can be used towards other recipes in her cookbook…so that $60 is not a complete waste. Do I recommend this cookbook? ABSOLUTELY! You can purchase her book HERE. Below is her recipe for Pan Bagnat. Use the modifications above, and I’m sure you’re going to love this sandwich. ENJOY! From Gwyneth Paltrow’s “It’s All Easy” cookbook. In simple terms, pan bagnat has all the components of a niçoise salad stuffed into a perfectly transportable sandwich form. I discovered this delight when I worked in France years ago. It is the perfect summer picnic lunch, best eaten outside on a warm day, preferably with a glass of chilled rosé in your hand. If that’s out of the question, though, it’s still pretty delicious eaten in the car while waiting for your kids to finish soccer practice. The quality of ingredients, particularly the tuna and baguette, really makes or breaks this sandwich, so try to find the good stuff. This is Gwyneth Paltrow's Favorite French Baguette sandwich. 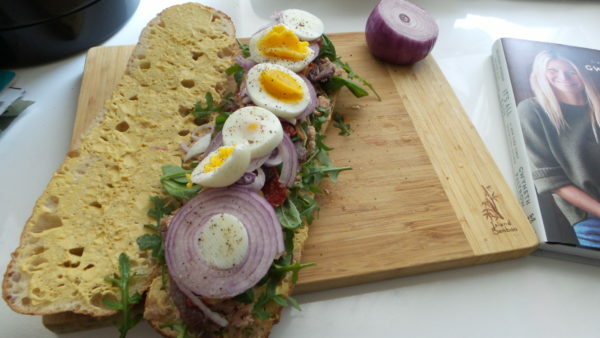 From her cookbook "It's All Easy"
Spread half of the baguette with a thin layer of Dijon mustard, then layer in the remaining ingredients, starting at the bottom with the arugula and finishing with the sliced eggs at the top. Season the egg with salt and pepper and press firmly to compress the sandwich. Eat right away or wrap in plastic wrap and store in the fridge for up to 24 hours. Cut into portions just before serving.